Why is the dialogue in Game of Thrones more “modern”? The Song of Ice and Fire series has medieval-sounding dialogue throughout. I don't have the books on hand for direct quotations, but phrases like "I would wager", "half a hundred times", "making a jest" or "making a jape" abound. The TV series often uses modern-sounding words and phrasing in the dialogue eg. I've heard "schedule", "getting credit for", "I would bet" (instead of wager). I'm not saying they're new words or phrases, but they do sound "newer" and more contemporary. Have the producers or writers of the show ever given any reasons for this? Beyond the obvious one of wanting to relate better to the audience? No-one knew whether viewers would accept a "serious drama" about power politics with a fantasy setting. This article shows how much of the early criticism and rejection of the show (particularly from mainstream critics) was essentially a knee-jerk reaction to the fantasy genre, and how the producers did famously try to pitch the show as "Sopranos in Middle Earth", emphasising the politics and drama over the fantasy setting. I thought there was an interview where one of the producers said explicitly that toning down the fantasy styling where possible (including dialogue) was a deliberate part of making the show appeal beyond fantasy fans, but I can't find it now I look for it (please comment with a link if you have one!). Show-only expressions like "Gods be good", "Seven hells! ", "It is known" and "the iron price" stand out from normal dialogue and flesh out the religions and traditions of the show's world, helping keen viewers to see and understand cultural differences between characters. Elaborate fantasy-esque character titles like "the sword of the morning" stand out from normal descriptions, and tell the viewer that the person or thing referred to has legendary status within the world of the show. When characters like Dany give themselves such titles, the contrast with normal speech tells us more about their aspirations and character. Fantasy critters are described using outdated or unfamiliar words by characters who are skeptical or dismissive (e.g. "snarks and grumpkins"). Making it sound old-fashioned or make-believe to our ears helps us understand that this is how the characters see it, too. Medieval-style etiquette is sometimes added to normal dialogue, usually when it tells us something about the medieval-style power or status dynamics. For example, "My Lord" and "m'lord", the politics around who calls who "your grace", various medieval ways of showing deference such as "if it please", etc. When characters drop these formalities and address each other in a normal, modern sounding way, that too tells us something about the relationship (e.g. when Marge was befriending Sansa and the language between them got progressively more modern and casual). This wouldn't signify as much to the viewer if everything the characters said sounded equally old fashioned or fantasyish to our ears. 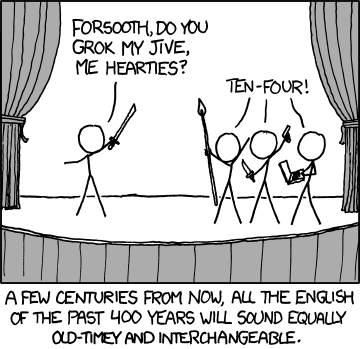 Obligatory XKCD cartoon. Understanding the characters' position in and perspective of their history is an important part of the depth of the show, and one the books can build through book-only tricks that don't work in a TV show like using internal dialogue for exposition, using quote marks around set phrases, and long asides. It's easier to get away with using non-standard language in a book because readers can look up a word they don't recognise, slow down while reading a difficult passage, or skip back to re-read something that didn't quite make sense the first time. There are several paragraphs in the books that I struggled through and in some cases had to re-read after I'd figured out that, for example, a "destrier" was a type of horse, a "capon" a type of game meat and a "cog" a type of ship. In a TV show that is already pushing the boundaries in terms of the number of characters, storylines and things to remember, anything that reduces viewer confusion will help. as far as i can say, too much "medieval talk" could be a bit uncomfortable to the viewers as they need to be more concentrated in order to catch up with the exact meanings of what the characters are actually talking about. Think of all the plain public who's viewing it just for the fun of it (nice girls, monsters, battles and so on) - making it too hard for them to follow up what's going on could be contraproductive. just to be clear: i am not saying, that they wouldn't understand nothing but it would be 'uncomfortable'. in addition, there are surely groups of viewers based on age, education, origin, whatever, who simply wouldn't understand "i would wager" but just "i would bet". Not the answer you're looking for? Browse other questions tagged dialogue game-of-thrones book-adaptation . Why was Jeyne Westerling replaced by Talisa Maegyr in Game of Thrones? Why is Game of Thrones aimed at such a mature audience? What is the purpose of the changes to Game of Thrones show? Why are knights titled “Ser” in Game of Thrones? How many seasons of Game of Thrones will there be by the time it finishes? What has changed in Season 5 of Game of Thrones compared to the books? What are the lyrics to the Game of Thrones theme? Is Game of Thrones the first book adaptation which has overtaken the book it's adapting? Why aren't there Wildfire weapons in Game of Thrones?